Making homemade tortilla chips is easy. 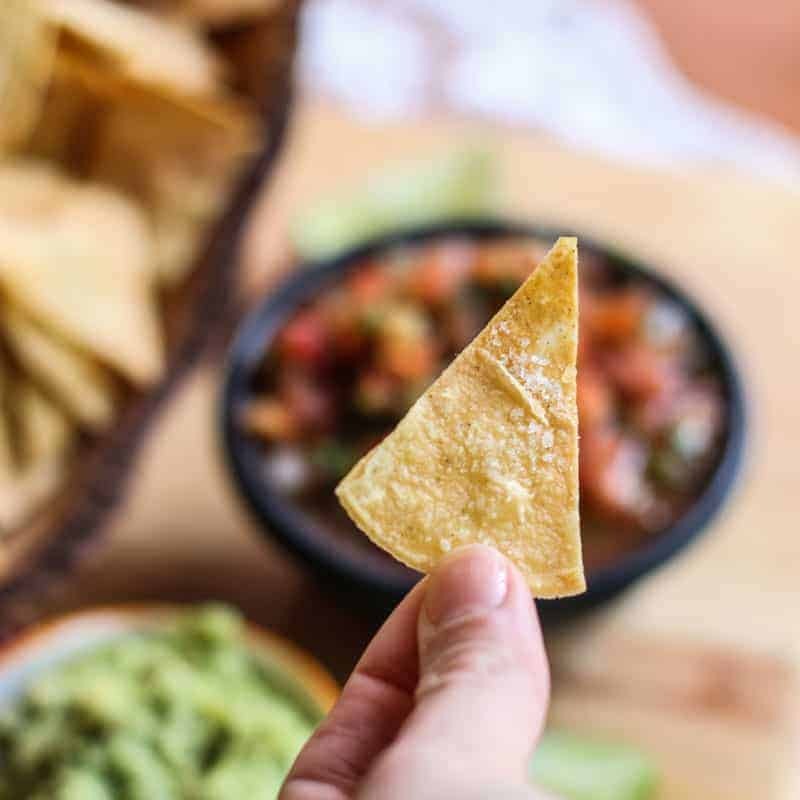 With only three ingredients, you can have crispy, crunchy, salty, tortilla chips that taste even better than the restaurant chips! 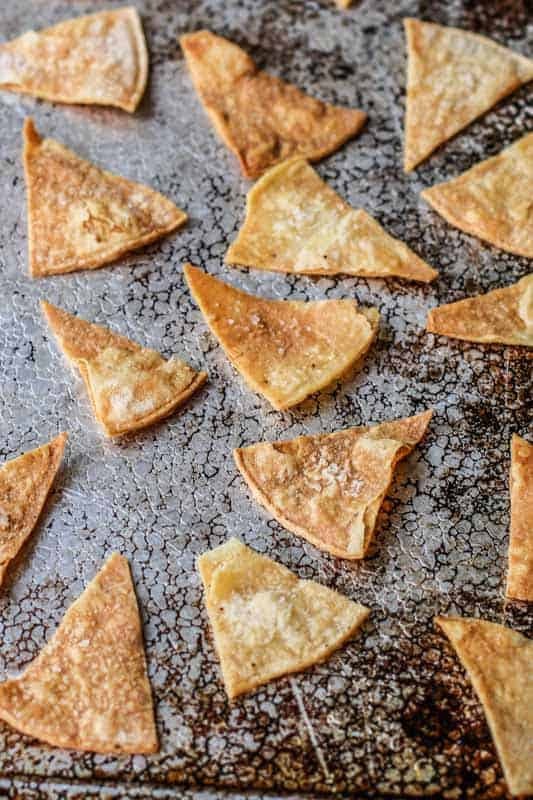 The best thing about this recipe is they are baked tortilla chips, not fried! Therefore these chips not only taste better than the fried versions, they are healthier also! Are you a salsa and chip fan? To me, nothing is better than perfectly crisp, crunchy chips. They are definitely my weakness. If I can dip them in my homemade salsa, tomatillo salsa verde, or guacamole… all the better! I was once in a small Bible Study group that met together once a week for lunch. One day, one of the ladies brought homemade tortilla chips. They were incredibly crunchy, perfectly salty, and had hardly any hint of oil. I couldn’t believe they were homemade. I, of-course, begged her immediately to tell me how she made them. She explained how easy baked healthy tortilla chips were to make. Cut your favorite brand of corn tortillas into 6 pieces. Brush or spray olive oil. You can use a different oil like avocado oil, coconut oil, or peanut oil. I prefer olive oil. Next, you dust them with a very coarse salt. Then bake them at 375 for 10-15 minutes. How easy is that? These healthy tortilla chips have just as much flavor as the fried greasy versions and pack an even bigger crunch. I have been making these now for years. I can’t believe I am just first getting these to the blog… OOPS! So here are some tips for making the perfect chips! Dark sheet pans make a crispier chip and cook faster. If you use a dark pan, keep an eye on the chips. They cook very fast at the end and you may have to adjust the time. You can brush olive oil, but you will use more olive oil that way than you need to. So my suggestion, if possible, use a olive oil mister or sprayer. This will allow you to lightly even coat the chips. Use a good, coarse, crunchy salt. You can use less salt with a coarse salt. It also adds more flavor and texture to the chip. Want to make a spicy variation? You can use my Jalapeno Salt to make it spicy. A little goes a long way, so be careful! How long do homemade baked chips last? Store those crunchy homemade baked chips in an airtight container. Then they will last one to two weeks long. However, they never last more than a day or two in my home because they get eaten! 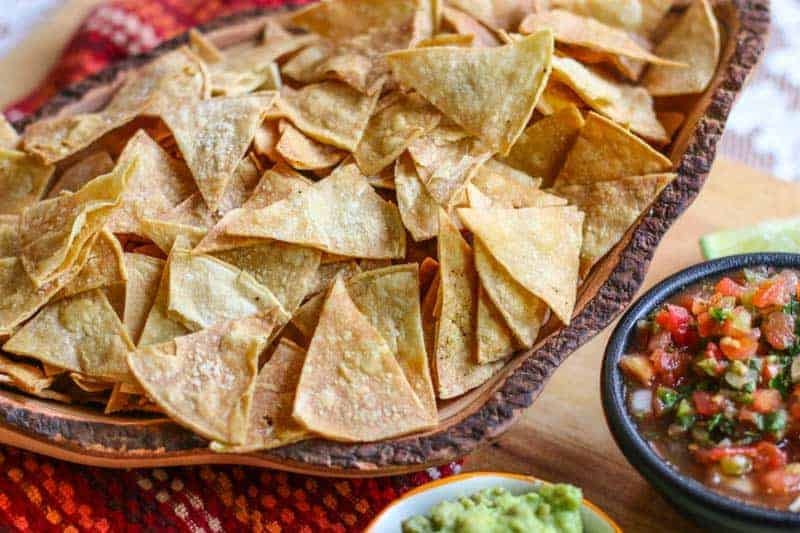 Making homemade baked tortilla chips is easy. 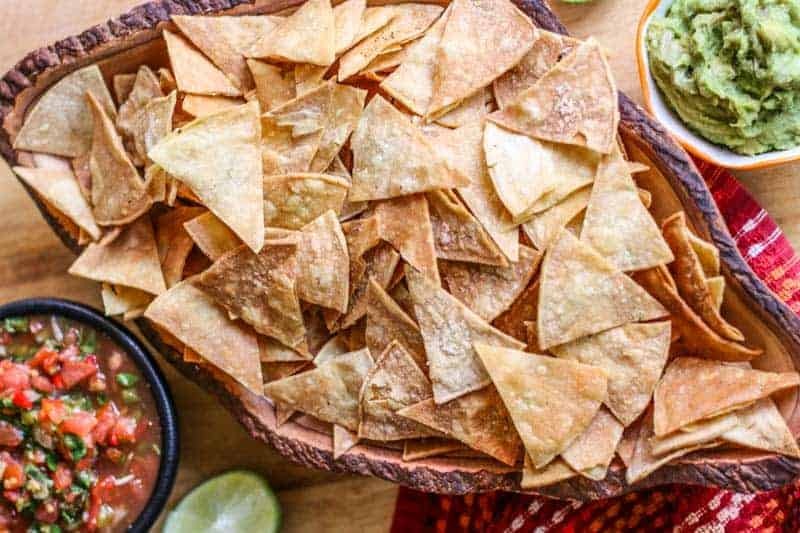 With just three ingredients, you can have crispy, crunchy, salty, healthy tortilla chips that taste even better than the restaurant chips! Spray or brush olive oil over each tortilla. Cut corn tortillas into quarters. Then cut quarters into halves creating 8 chips per tortilla. Bake 10 to 15 minutes depending on your baking sheet. Darker baking sheets cook faster. They are done when completely crunchy. You may need to cook in multiple batches. Let chips cool before serving. Store in airtight container. They should stay crispy up to a week. Cooking time may very from 15-25 minutes. Keep an eye on them until they reach the color and crispiness you like. I know right? I have to limit the times I make these because I could eat the whole batch all by myself. My new ❤️, these chips are awesome! And easy. 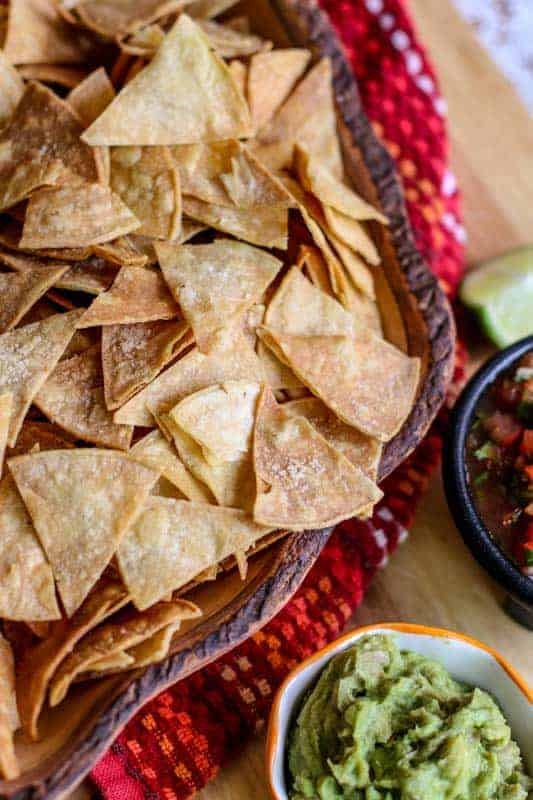 I’ve always done baked tortilla chips because they are taste better, are inexpensive, and you can always have the fresh corn tortillas in the refrigerator ready to make YUMMY CHIPS!!!!! Your pics look so good too girl! Damn, pass me the chips, dip, and a big MARGARITA!! !